Fish Hawk X4D now with Bluetooth Smart wireless technology! NEW FOR 2015 - You'll get trolling speed and water temp at the lure, the true running depth of your downrigger weight, and surface temperature and speed - all key information for succesful trolling. 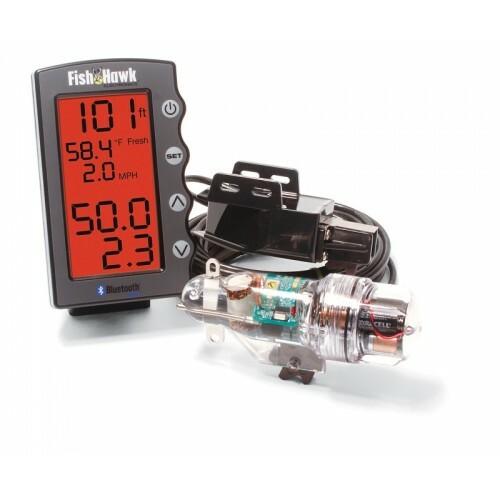 The Fish Hawk X4D uses Bluetooth Smart wireless technology to send data to your mobile device and the free Fish Hawk Mobile App turns your smartphone or tablet into an extra display anywhere in the boat. The App's Catch Log feature lets you quickly record the species, size, GPS coordinates, time, probe data, and lure notes everytime you catch a fish. The app also lets you quickly and easily share Catch Log information with fishing bubbies in other boats via text or email. This complete system includes: the X4D Trolling Probe with protective bumper, LCD screen with mount, transom mount transducer with bracket and hardware, 12-volt power cable, and breakaway cannonball safety cable.